→Makita JR3070CT AVT Reciprocating Saw Review: Poor Shoe Design? Makita JR3070CT AVT Reciprocating Saw Review: Poor Shoe Design? If you’re looking for a sturdy reciprocating saw that can be used for a variety of jobs from cutting through nails to metal to drywall and wood, then the Makita Sawzall JR3070CT might be just the tool you need. It has less vibration than other saws of this type, due to the unique Makita AVT technology. This allows more power to be transferred to the tool rather than being wasted in producing vibrations. This Makita reciprocating saw offers tool free blade adjustments as well as a clutch that protects the gears if the blade binds up. ​What type of motor does it have? ​Does it have a lot of vibration? ​Is it comfortable to use? Do the blades have to be installed in one direction? Is it a 2 or 3 prong plug? Are there batteries to buy? Does it have a variable speed trigger? How do I safely use it? This Makita reciprocating saw JR3070CT has a powerful 15 amp motor that has maintains its constant speed even under a heavy load. It has six different speeds built in that matches the power needed depending on the surface you’re cutting. The stroke is 1.25 inches and 2800 strokes per minute, which means this saw cuts fast and accurately. If you’ve used some older Makita sawsall models or reciprocating saws from other manufacturers, you may have noticed they just about rattle out your teeth with their vibration. With this model, Makita has incorporated a counterbalance system that reduces the vibration. This not only makes cutting more comfortable but also more accurate than older models. ​This technology is called AVT (anti-vibration technology) and is adapted from the same science behind earthquake engineering and makes this tool have up to three times less vibration and less noise than competing models. It does this by using a mechanical damper that delivers an equal mass at the point directly opposite where the striker bolt makes the impact to the saw blade or bit. ​Of course, when there is less vibration, there is more efficient power because the energy generated goes right into the task at hand instead of up your arm or away from the machine. While most occasional users won’t be bothered too much with extra vibration, you’ll definitely notice the difference here if you have to use the tool for more than ten minutes or so at a stretch. This model weighs less than 10 pounds, which isn’t much for this type of tool, but it’s heavy enough to be sturdy when cutting. As far as the housing, it has a durable body that’s designed to keep dust and dirt away from the motor. It also has a comfortable ergonomic grip that makes it easy to handle. ​As an added bonus, you don’t need any tools at all to change the blade. ​As far as user reviews, people who own one of these seem to love it – professionals and amateurs alike. One man who is a carpenter bought one and he says it’s the best tool he has ever held in his hands. He says he’s so impressed with the cutting action in his review and says it’s so much better than his previous Milwaukee Sawzall. This tool is designed for a variety of applications. It can do demolition, remodeling, cutting of wood, metal, plaster, drywall and plastic. It’s a great tool to have if you’re just working around the house or if you’re a roofer, builder, general contractor or metal fabricator. Like with most corded tools, the motor of this one does have brushes. Brushes are used to conduct the current between the stationary wires and the moving parts. Brushless motors are rapidly becoming in cordless tools, such as in this Ego string trimmer. You can install the blade upwards or downwards – whatever works best for you. This means you can install it to cut to the back or the front of the saw. The JR3070CT operates on a 2-prong plug that is polarized, meaning one blade is more narrow than the other. Currently made by Makita, although Dolmar is slowly taking over the manufacture of Makita chainsaws, which may extend to the full range of tools. This is a corded electric saw, so there are no batteries to buy, charge or swap out. Because of this, you’ll find it has more consistent power as there are no batteries to die down. Instead, it’s ready to go when you are simply by just plugging it in. It does not have a variable speed trigger. Instead, it has different preset speeds (six of them) that matches the power needed depending on how you’re using it. Makita is a long-standing company with a solid reputation and offers a one-year warranty on the JR3070CT which includes parts and labor. They even pay the freight charge for shipping it. If there is a defect in workmanship or in the materials, they will replace or repair the unit at no charge. Additionally, if you’re not satisfied with it in the first 30 days, you can send it back for a full refund or replacement. As with most any warranty, it will be void if you’ve repaired or modified the item yourself or if you’ve misused it, causing it to break. This just means if you have any problem, send it in instead of attempting a fix yourself. The warranty comes with the purchase, so it’s best to let them handle it. 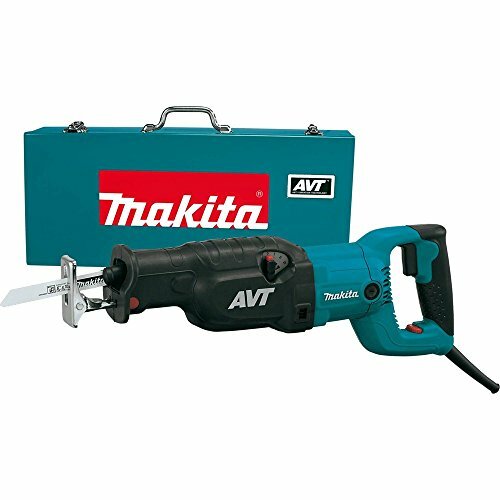 AVT, short for anti vibration technology, is a unique counterbalancing system developed by Makita, and is very effective at reducing vibration and turning that otherwise wasted power into more usable power for the tool, resulting in more cutting power. Unlike circular saws, which only cuts in one direction and rotate, a reciprocating saw alternates direction to move the blade forward and backward. Essentially, it’s the equivalent of a really big jigsaw, where the blade moves up and down. You can purchase blades for them that are designed to cut through drywall, plaster, plastic, metal, wood or even wood with nails in it. They typically weigh between six and ten pounds and have a handhold on the back and one on the front for stability when cutting. Some models offer variable speed controls, some you need a tool to replace the blade, and some operate with just a hand lock so no tools are needed. First, it’s a best practice to always wear safety goggles when cutting to protect your eyes from any flying debris. To get started, pick the blade that’s appropriate for the job, then firmly seat in in the blade holder. Adjust the shoe (bottom part of the saw that guides the blade) to the correct height and bevel. Then you’re ready to start cutting. If you’re cutting a hole, say in drywall for instance, you can just punch the end of the saw through. If you’re cutting a sturdier material, you’ll want to drill a hole first so you have a place to start. When you’re ready, plug your saw into the electrical outlet and hold it firmly. Get the blade aligned to where you want to cut, press down on the safety switch, then pull the trigger. Go slow and steady, following your marks for cutting. When you come to the end, make sure you or someone else holds the end of the material so it won’t splinter because its weight is not supported. It’s a good idea to periodically clean your sawsall or reciprocating saw to keep it in good working order. You can use an air compressor or hose to blow out any dust and debris, or you can use a brush to clean it off. Of course, getting any electrical tool wet is not a good idea, so just wipe it with a soft cloth if you need. As for the blades, you can have them sharpened just like you would any knife or blade. However, most modern blades are inexpensive enough and are easier to replace than to maintain. While owners overall give this tool 4.5 out of 5 stars, there is one possible issue of which you might want to be aware before buying one. Some users (people who use this tool on a daily basis in their professions) say they would prefer having to use a tool to secure the blade. While it’s handy to not have to use one, they say the blade does not stay seated as securely as they would like under heavy use. Keep in mind this is less than one percent of reviewers, but it is important to those users, as they have seen the rubber boot where the blade sits rubbing or breaking off after heavy use. While this probably won’t be an issue for occasional users, if you’re a professional handyman or carpenter and will be using your saw every day, you may want to explore options that have a more secure blade system. Overall, the Makita JR3070CT Sawzall gets good reviews and is a very handy reciprocating saw to own. If you’re working on small projects or are an occasional user, this model is definitely worth considering. However, if you’re a contractor or plan on having this as your go-to all day every day, you might look at choosing a model that uses a wrench to seat the blade for more security.